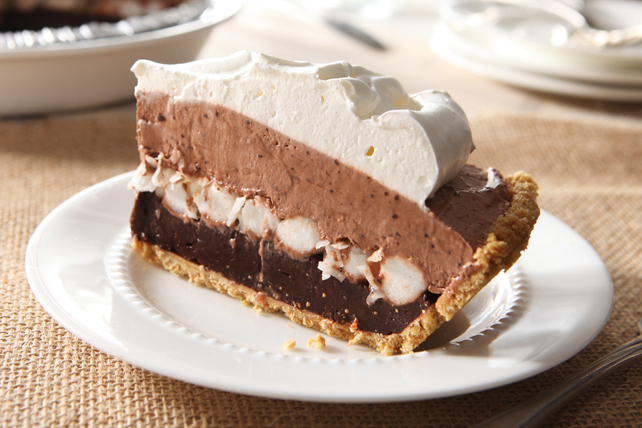 This creamy chocolate pudding pie is as easy to make as it is scrumptious—which is to say, very, very! Get out the marshmallows and let's go. Spread 1-1/2 cups pudding onto bottom of crust; top with marshmallows, then coconut. Stir 1-1/2 cups Cool Whip into remaining pudding; spread over pie. Refrigerate 3 hours. Top with remaining Cool Whip before serving. Reserve a few of the marshmallows and 1 Tbsp. coconut; use to garnish pie just before serving.